1. Divide the mince into 4 and press into rough rounds. Heat the oil in a heavy-based frying pan, add the burgers and press down with a spatula. Cook for 3-4 minutes on each side, until browned, piping hot and cooked through. Top with the cheese, then set aside on a plate, loosely covered with foil, to rest for a few minutes. 2. Lightly crisp the cut-side of the buns in the same frying pan over a medium heat – add a little more oil, if the pan is too dry. 3. 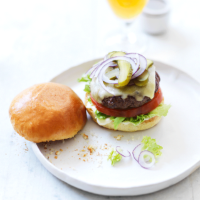 To build the burgers, fill the buns with the lettuce and tomato, top with the burgers, sliced gherkins, onion and your choice of condiments. Dip the cut sides of the brioche lids in the resting-meat juices and place on top to serve. This recipe was first published in Fri May 12 10:22:10 BST 2017.